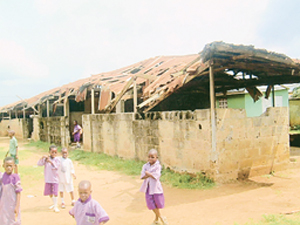 Terrible Learning conditions:Where was Tinubu? Where is Fashola? | Thy Glory O' Nigeria..! ← EFCC, Don’t deceive Nigerians, Just do it! Terrible Learning conditions:Where was Tinubu? Where is Fashola? LOOK AT Lagos State Primary Schools! The Punch Newspaper has done it again. Giving us pictures that show the kind of governors that we have in Nigeria. 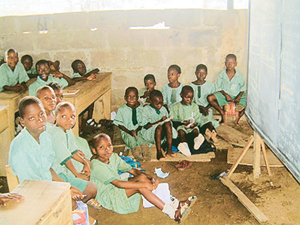 Please look at the pictures of some primary schools in Lagos. All pictures are courtesy of the Nigerian Punch Newspaper, Friday 23rd Nov 2007. This is the inside of a classroom where knowledge is supposed to be given and taken. This is the 21st century and this is what Tinubu bequeathed to Lagosians. Outstanding lagacy! That there is still one school in Lagos or several of them that are under this kind of condition is a BIG Shame. Where was Tinubu? Who was the shameless commissioner for Education? Where is the new governor? Where is the new commissioner? Does Tinubu’s children go to this kind of schools? Is Fashola’s child in this school? Seeing this picture reminded me of what I went through in 1985/86. Just like this kids, I found myself becoming a carpenter overnight. I had to make my own desk and bench from broken woods scattered around my school then. In Festac Grammar School, the Lagos State Goverment hypocritically built the first storey building in the (then) Ojo Local Government. That was like in 1985 or 86. Afterwards, they abandoned Festac Grammar School and never built anything more. I am not sure that they have built any more storey building as I write this. If they have, it must be new. If they haven’t, true to type, dirty hypocrites! If children spent their valuable time trying to make tables and benches, when do they learn? where is the motivation to learn? 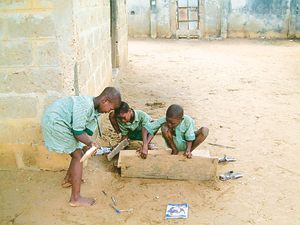 Can Tinubu or Fashola allow their own kids to make benches and tables? I mean, when it is not part of the Technology scheme, it is simply child labour!!! If you keep chicken in this type of a house, it is wickedness! But you know what, this is where some kids, the future leaders of Nigeria are being trained by the Lagos State Government. When it rains, it is worse than hell. What kind of people are ruling in Nigeria??? Do they have brains? Do they think? Posted on November 25, 2007 by Adeola	• This entry was posted in Uncategorized. Bookmark the permalink.